BAR HARBOR — Twenty years ago, Valerie Peacock was assistant harbormaster here and the arrival of a cruise ship was a novel event. 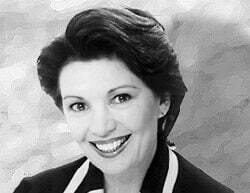 A great passenger liner would drop anchor, and locals hanging around the town pier – adults reading the paper, kids with bicycles, teens jigging for pollock – would stop and gawk at the spectacle. “It was kind of exciting, and people would come in to town just to see them,” says Peacock, now an education consultant. “People were coming to town in a different way, and the ships were exciting, and we as harbormasters had to work out how to get the tenders into the town pier and how to get the people on and off them. Two decades later, the novelty is gone. 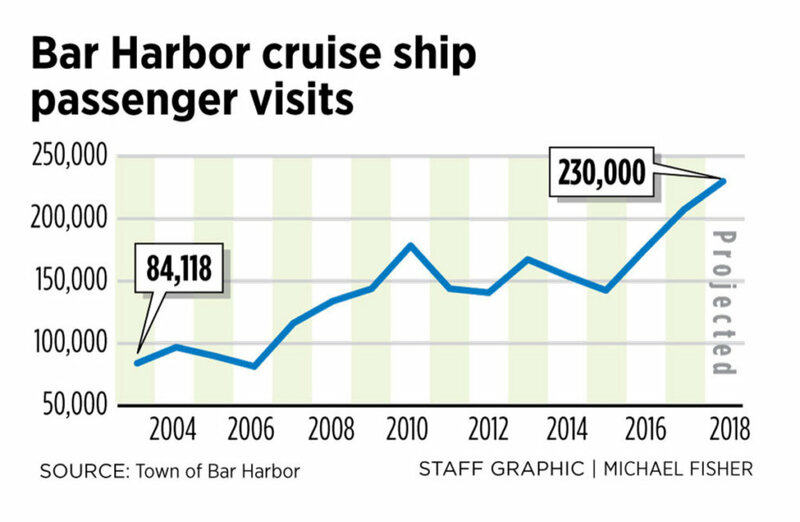 Bar Harbor expects 230,000 cruise ship passengers to march ashore on Water Street this year, a 257 percent increase from 2003, snarling traffic with tour buses and overwhelming sidewalks for blocks around on busy fall days. 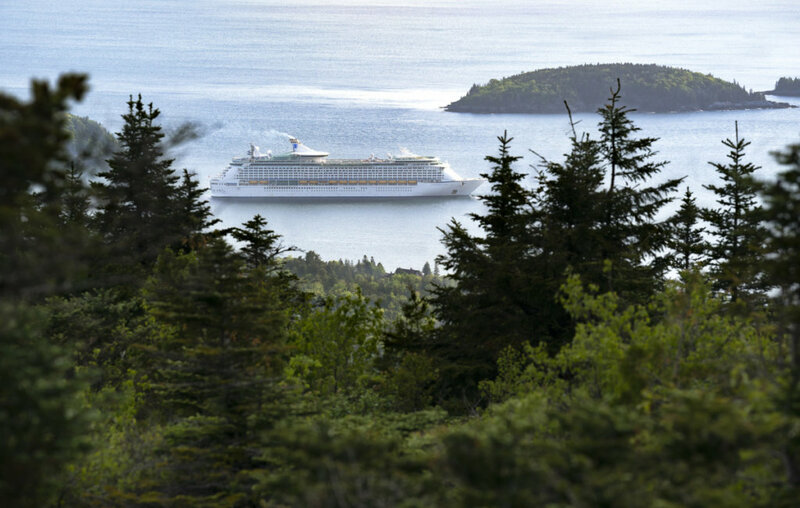 From the top of Cadillac Mountain, the biggest ships – 17 stories tall, with 6,400 passengers and crew – will dwarf the Porcupine Islands and add plumes of exhaust to Acadia National Park’s most famous vista. But while merchants celebrate from the tide of passengers, which crests southward through town like clockwork before receding back onto the tenders and out to sea, four neighboring towns have imposed moratoriums on cruise ships in an effort to keep the flood off their doorsteps. Cruise tourism on the island has reached a tipping point. The future course of cruise ships on Mount Desert Island awaits a ballot question Tuesday, when Bar Harbor residents will decide whether to purchase an abandoned, state-owned ferry terminal just north of town for use as a public marina, park and, most probably, an alternate landing for cruise ship tenders. If they reject the $3.5 million purchase, the Department of Transportation will put the property on the open market, and some fear that could result in the construction of a quarter-mile-long pier where cruise ships could tie up, instead of anchoring in the harbor and ferrying passengers ashore. Maine’s state government and coastal communities have been working hard to lure cruise ships to the state in an effort to grow and diversify the vital tourism sector. Until recently, little attention has been paid to the critical questions other communities around the world have faced: Are cruise ship crowds trampling the fabric of our towns? What are the real costs and benefits? Is it all worth it? Maine ports of call are now grappling with how to best take advantage of this expanding tourism sector – which has helped keep seasonal businesses open longer and has exposed millions of first-time visitors to the charms of the Maine coast – without overwhelming their communities to the point where their charm is lost. Their experiences are as varied as the coast itself, from teeming Portland, where business owners and city officials see ample room for growth, to Southwest Harbor, which has passed a moratorium forbidding cruise lines from landing passengers anywhere in town. A four-month examination by the Portland Press Herald/Maine Sunday Telegram has revealed a range of challenges facing Maine’s cruise ship ports as they interact with the fast-growing $38 billion industry, which is under intense pressure to capture as much passenger spending revenue as possible in order to maintain profitability, even as it is criticized for overwhelming historic, cultural and touristic assets in destination communities. Estimates of the economic benefit of cruise passenger visits in Maine have been exaggerated – especially for Portland – while many of our municipalities have failed to think strategically about how to minimize the costs and maximize the benefits of cruise tourism. In addition, the state has the weakest protections against ship discharges in New England, potentially undermining the health of coastal marine environments. Ironically, the global cruise industry can trace its corporate roots to Maine and the Eastern Steamship Company, an empire founded by Charles Wyman Morse of Bath in 1911 that provided passenger service between Boston and many harbors in Maine and the Maritimes. But by 1954 commercial airlines began to displace oceanic travel, and Eastern had learned it was losing its final route between Boston and Yarmouth, Nova Scotia, because Canada had decided to run its own subsidized ferry service with a new vessel called the Bluenose. Enter Frank Leslie Fraser, the pioneer of the U.S. cruise industry, who bought the distressed company and transferred its aging twin 450-passenger ships, Evangeline and Yarmouth, to the sleepy port of Miami to run leisure cruises to the Caribbean and Central America. Flagged out of Panama to avoid U.S. taxes and regulations, the ships were refitted with air conditioning and tiny swimming pools, and catered to middle-income customers looking for a quiet, stress-free break in the tropics. The model worked, and Eastern expanded, attracted rivals, was bought and sold, and was eventually folded into Royal Caribbean. The global industry has grown phenomenally in recent decades, from 500,000 passengers in 1970 to 7.2 million in 2000 and more than 28 million today, and its current 8 percent annual growth rate is triple that of the tourism industry as a whole. More than half of all cruise passengers begin their trips in the United States, where the “big three” companies – Carnival Corporation, Royal Caribbean International and Norwegian Cruise Lines – are headquartered, though incorporated in Panama, Liberia and Bermuda respectively for tax and regulatory reasons. Carnival alone has more than 100 ships operating under 10 brands including Cunard, Holland America and Princess. Ships have been getting bigger as well. The Pacific Princess, the ship that popularized cruise travel as the star of the 1970s TV series “The Love Boat,” was 550 feet long, carried 620 passengers and displaced 20,000 tons. Royal Caribbean’s Anthem of the Seas – which calls on Portland this fall – is 1,200 feet long, carries more than 4,900 passengers and displaces nearly 170,000 tons. It is in turn dwarfed by the new Symphony of the Seas, which carries nearly 7,000 passengers and displaces 228,000 tons, and features two surfing pools, an eight-story water slide, a tree-lined open-air “central park” with 20,000 tropical plants and an indoor shopping mall. For ports of call, one implication of the growth of the industry and its ships has been that a lot more passengers are coming ashore, and more of them all at once. In popular destinations – places like Venice, Italy; Dubrovnik, Croatia; and Charleston, South Carolina – peak-season cruise-ship crowds are feared to have diminished the towns’ attractions and reputations, repelling higher-spending land-based tourists. Preservation, conservation and neighborhood groups in Charleston sued Carnival, arguing cruises were a public nuisance – on account of noise, pollution and traffic – but the state Supreme Court dismissed the case on a technicality in 2014. Venice – a city of 50,000 that sees 30,000 cruise passengers a day in peak season – in November banned large ships from the city center after UNESCO warned that the city, a World Heritage Site, was endangered by them. The gates, streets and narrow alleys of the walled city of Dubrovnik – where the King’s Landing segments of the television show “Game of Thrones” are filmed – become impassable on cruise ship days. “Cruise ships are very welcomed out of season, but in peak season days it’s so overcrowded people can’t move down the city’s main street,” says researcher Zrinka Marusic of the Croatian Institute of Tourism in Zagreb. Digging into Carnival and Royal Caribbean’s financial statements, Michael Vogel of Germany’s Bremerhaven University Institute for Maritime Tourism discovered that between 2001 and 2014 the lines faced declining revenue per passenger cruise day, the result of having to reduce ticket prices to keep ships full. Indeed the tickets – which include on-board food and entertainment – no longer cover the lines’ costs, Vogel found, which has made them dependent on on-board purchases for profitability, giving them an incentive to sell more merchandise, drinks, premium meals and highly marked-up shore excursion packages from them. Norwegian Cruise Lines took things a step further in 2016 by opening a private port on its own 78-acre island off Belize, where passengers rent air-conditioned beach villas and poolside lounge chairs and buy adventure excursions or meals at five restaurants and bars. Royal Caribbean leases its own destination islands in the Bahamas and Haiti, while Carnival passengers pay to horseback ride, kayak, or snorkel at Half Moon Cay, the company’s Bahamian island. 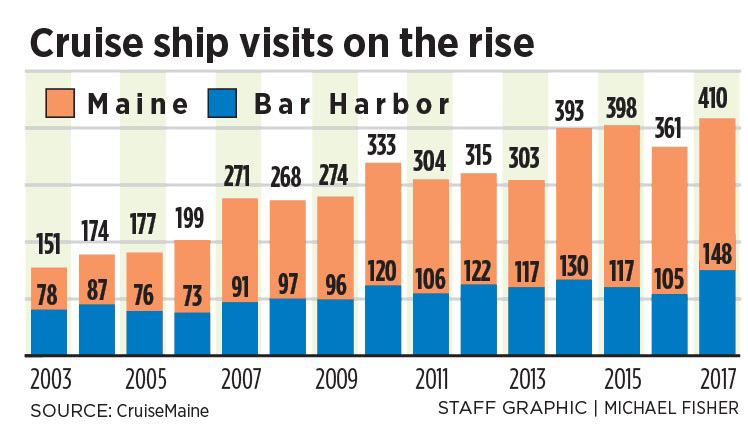 Maine has seen dramatic growth, from 130,000 passengers and 142 ship visits in 2002 to more than 378,000 passengers and 410 ship calls last year. Bar Harbor has seen the lion’s share, wracking up more cruise traffic than the rest of Maine’s ports and harbors combined. Large ships also visit Portland and Rockland, while smaller, 100-to-300-passenger “expedition class” ships call on a half-dozen smaller harbors: Bath, Boothbay Harbor, Camden, Belfast, Castine and Eastport. The smaller ships – mostly U.S.-flagged vessels operated by U.S. companies – have generated few complaints, as they bring fewer passengers who typically spend more time and money ashore. The larger ones are regarded as a mixed bag. 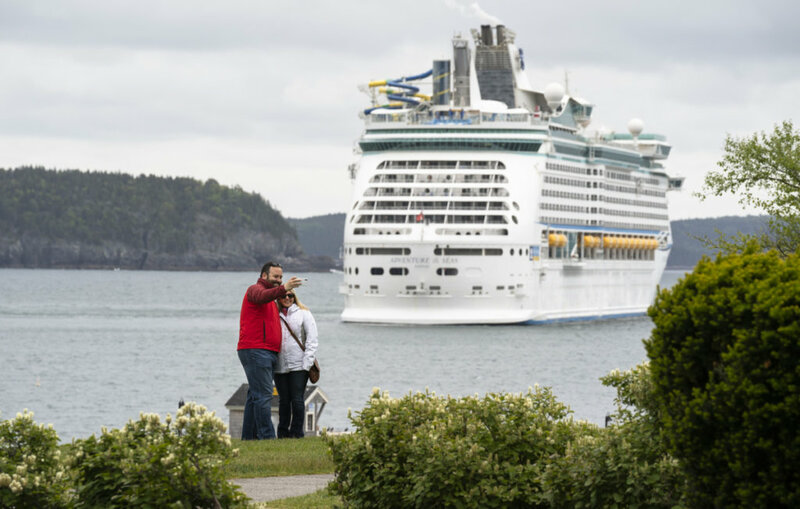 In Bar Harbor, many residents and business owners agree cruise ships have brought benefits to the town, primarily by giving seasonal business owners reason to open earlier in the spring and stay open late into the fall. “When I was growing up, it was more like other coastal towns where Labor Day is definitely the end of the season,” says Jeff Curtis, owner of the Sherman’s Maine Coast Book Shops, who grew up right over the Bar Harbor store, a few yards from the waterfront. “Now it goes on through the whole month of October.” The season now starts on whatever late April day the first cruise ship calls. But it was the town council’s plan to build a cruise ship pier at the old ferry terminal north of town – the one the Bluenose and Cat once operated from – that catalyzed public opinion against further growth. Only tiny ships like American Cruise Lines’ 104-passenger, 96-ton Independence can dock at Bar Harbor’s existing piers. All the larger ships anchor and contract Ocean Properties, the Florida-based hotel development company founded by Brewer native Tom Walsh, to pick up their passengers with tenders and land them at the company’s dock at its Harbourside Hotel and Marina, which encompasses much of the downtown waterfront. In 2007, town council chairman Paul Paradis recalls, the town learned The Cat would soon end its Bar Harbor-Yarmouth runs and its terminal would be on the market. “We felt, geez, that’s a public maritime facility, we’d like to keep it that way, so how can we do that?” says Paradis, owner of Paradis True Value Hardware. “We engaged a consultant who said: ‘You’re in the cruise ship business now, but you’re doing it like they did in the Dark Ages.’” A $30 million pier and cruise terminal would eventually pay for itself, consultant Bemello Ajamil advised in its 2012 report; if it was not built, the increasing size of cruise ships would likely result in “a steady decline of traffic” because tendering passengers ashore would become unmanageable. The town council itself has been sympathetic to the cruise lines’ concerns, and the council’s original plan to rectify them was to have the Maine Department of Transportation purchase the terminal property and the Maine Port Authority develop and operate a cruise terminal. But a public revolt over the growing scale of cruise tourism unfolded in 2016, spurring a lawsuit (still active) by property owners opposed to the cruise terminal; a June 2017 ballot measure to prohibit the largest cruise ships from visiting (which DOT helped defeat by threatening to sell the property on the open market if it passed); and acrimonious public meetings where residents denounced the pier plan. In the tumult, the port authority backed out of participation, and the DOT bought the property and told the town it would need to buy it from them and develop it themselves or else it would be sold on the open market. Last fall, as tempers flared, the town council convened a 40-member citizens committee to come up with a vision for what the community wanted to see happen at the property. The committee’s conclusion: The community does not want a cruise ship megapier but rather public waterfront access, a marina, and possibly a place for tenders and tour buses to exchange cruise passengers. “It was a fantastic process, because it gave 40 citizens a chance to take a deep dive into the issue and spend countless hours reaching out to the community,” says one of its members, Natalie Springuel, a marine extension agent with the Maine Sea Grant program. Others fear a developer could swoop in to build just such a terminal.